Like they say the best revenge for hardship is ensuring that you beat it to the game and become successful while on the journey of life. For Torrey Smith, he has lived through and grown through this adage. He is a brilliant footballer, extraordinaire in his tackle records and has shown his athletic skills with the Baltimore Ravens, San Francisco 49ners, the Philadelphia Eagles and the Carolina Panthers. With these teams, he has bagged a lot of accolades including two Super Bowl awards. Find out more about him below. There was nothing extraordinaire about the footballer’s birth although his birth was as a result of an extramarital affair between a military man, Clarence Rhodes whose name was not disclosed until Torrey was six and a fifteen-year-old girl teen, Monica Chante Jenkins, who acknowledged the fact that she was in love. Monica, his mother hid the details surrounding his birth away from everyone around her because she needed to protect her lovers status in the military. For this reason, a lot of family and friends who would have helped her raise her child took a walk. Yet she didn’t bulge and trained her son doing two jobs during the day and at night. From all indications, we wouldn’t be wrong to say Monica had mixed feelings when Torrey Smith came to be on 26th January 1989 but we are sure that today, she doesn’t regret her actions in keeping the young lad despite the circumstances surrounding his birth. As time went on, Monica had other children and then, Torrey Smith was old enough to play elder brother roles to the other of his siblings while his mother was away at work. That’s not all, he often did menial jobs which was his own little way of contributing to his family. With so much on Torrey Smith’s plate, his hardship at home didn’t come in line with his academics. He was one of the most respectful and intelligent kids while at Colonial Beach Elementary School. There, his skills in sports were not hidden, thus enabling his physical education teacher see the potential in the young lad. He encouraged him and enrolled him for most of the school’s sports camps where Torrey didn’t pay a dime for any camp he attended. The footballer moved to Stafford High School and showed his athletic prowess as a two sportsman, he played basketball and football with so much expertise and verve. As time went on, the times allotted for training on the two sports he loved began to clash and he was practically losing focus, so Torrey had to choose one of the sports over the other. Then, he decided to settle for football. Following his impressive performances as a footballer, Torrey Smith got a lot of scholarship offers from different sports inclined schools but he chose the University of Maryland over others. He majored in criminology and criminal justice while at the University. By the end of his college education, he had a collegiate football career record of 19 touchdowns, 2, 215 receiving yards in addition to 152 receptions. Torrey received lots of accolades during his collegiate career. It was no surprise when he was selected by the Baltimore Ravens in the 2011 NFL Draft as the 58th overall pick in the second round of the draft. That wasn’t all, a lot of sports analyst had excellent remarks about the footballer. However, his first appearance with the Ravens was not so beautiful as he was criticized for his poor contributions in the team’s first game. Subsequently, he improved in his speed and played excellently all through the years he spent with the team. Later on, Torrey Smith joined the San Francisco 49ners, he played with the team for two years, moved to the Philadelphia Eagles where his athletic abilities are still remembered till date. He is currently with the Carolina Panthers after he was traded by his former team. Out of the seven siblings that Torrey Smith has, one of his sibling who became a person of interest to both his fans and the world at large was Tevin Chris Jones. Tevin died on the 22nd September 2012 in a motorcycle accident. His end was a sad one because he couldn’t make it to the hospital as he was pronounced dead on the spot. On Torrey’s part, he grieved his loss where he gave his last respects to his younger brother in a game just 24 hours after the incident. The audience who attended that Baltimore Raven’s game observed a minute silence for the deceased. 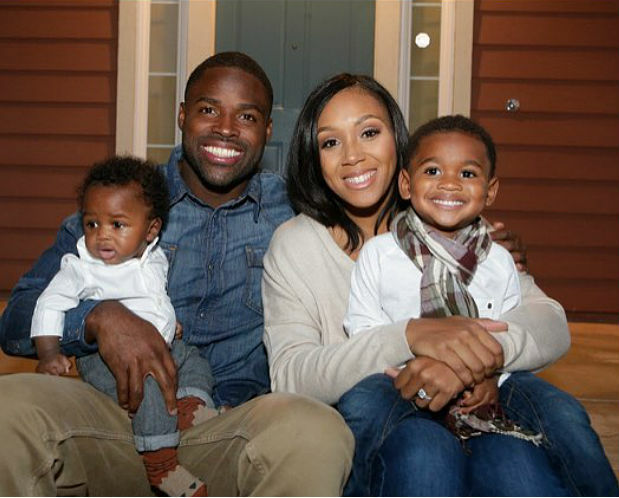 For someone who gathered experience in caretaking while he was a child, it is no surprise that Torrey Smith is acknowledged by his wife, Chanel Williams as a loving husband and father in their family. The two met at the University, fell in love with each other and later decided to officiate their union in July 2013. The couple is blessed with three children-Torrey Jeremiah Smith, Kameron James and the youngest whose name has not been revealed. Standing at 6 feet, of a truth, Torrey may not be considered as a gigantic athlete in the National Football League but he is surely among those who are a little above average height. Torrey doesn’t look like a 93kg weighted fella, he sure looks bigger than that, although we may agree to this because it is said that he doesn’t joke with his time at the gym.